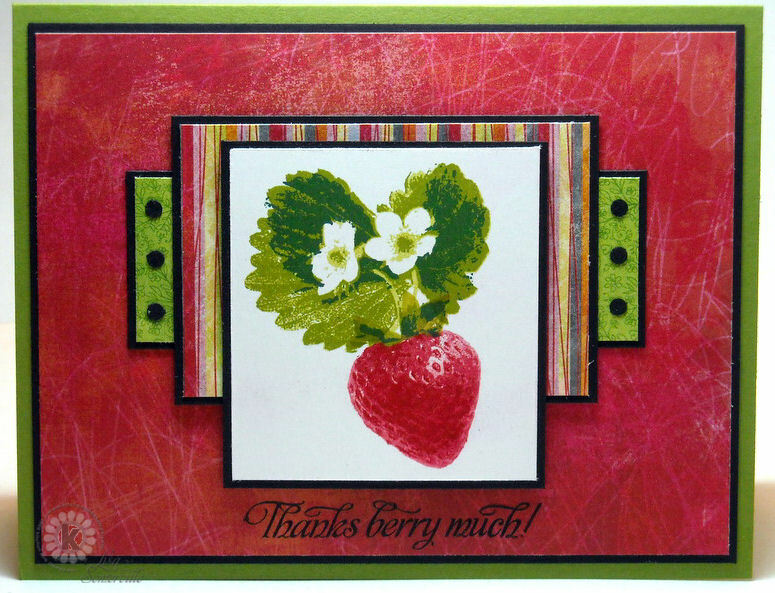 Designs by Lisa Somerville: Kitchen Sink Stamps - Thanks Berry Much! Kitchen Sink Stamps - Thanks Berry Much! Happy Kitchen Sink Stamps Monday! Thanks for stopping by, I hope you had a great weekend. Today I'm sharing a card and Video using Kitchen Sink Stamps Multi Step Berries. The images in this set look good enough to eat don't they! To create my card, I used SCS Sketch 279 as my layout inspiration. I used different pattern paper from Basic Grey's Sugar Rush collection, I thought it worked nicely with the KSS Strawberry image. See the color recipe below. Don't forget to grab your Kitchen Sink Stamps and play along with this month Challenge - see details here. Thanks so much for stopping by, for more Kitchen Sink Stamps inspiration, be sure to visit the other Design Team Members. This is breathtaking, Lisa!! The strawberry look so fresh and yummy!! I love the DPs you used, too! Beautiful work as always. Just beautiful, I can almost taste it! Video is really great, thanks. Oh I love this Lisa!! You berry looks so yummy, and you totally rocked this sketch!! Gorgeous work with this perfect strawberry, Lisa, showcased so beautifully with your fun layout and sensational papers!! Oh wow, Lisa! This strawberry DOES look good enough to eat! 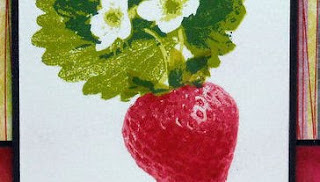 And you are right, that Sugar Rush paper works SO perfectly w/ the strawberry! Like it was made to go together!!!! LOVE it!!!! Love it. Fantastic stamping Lisa. This strawberry is so luscious! I can practically taste it! Looks so berry good! Couldn't resist. Great video! THe image is wonderful and fantastic design! Love the strawberry card it ! Beautiful job! Great video. I've always struggled with having only a limited amount of ink colours. Can't wait to try the stamping off technique. Thanks so much, it was good to see how it's done.